What we know about the life of Saint David, the patron saint of Wales and one of the early saints who helped to spread Christianity among the pagan Celtic tribes of Western Britain. 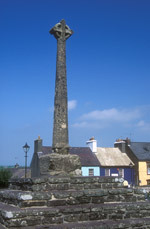 Saint David’s Cross, St Davids, Pembrokeshire, WalesSaint David, or Dewi Sant as he’s called in the Welsh language, is the patron saint of Wales. His day is 1st March. There aren’t many facts about St David; but here are the only undisputed ones. His shrine became a great place of pilgrimage; four visits to the shrine at St David’s were considered the equivalent of two to Rome, and one to Jerusalem! Girl in national costume of Wales ©St David’s Day has been a national festival in Wales since the 18th century, and is still marked with gusto. Many people will wear either a daffodil or a leek, which are both symbols of Wales. The other Welsh symbol, Y Ddraig Goch (the Red Dragon, Wales’s national flag), will be flown on many more buildings than usual. Concerts are held to mark the occasion, particularly male voice choirs. Saint David’s Day begins in many Welsh primary schools with a religious service. Children dress in the traditional Welsh costumes. Folk dancing in the ruins at Saint David’s ©Girls wear a petticoat and overcoat, made of Welsh flannel, and a tall hat, worn over a frilled bonnet. Boys wear a white shirt, a Welsh flannel waistcoat, black trousers, long wool socks and black shoes. Chilldren enjoy traditional Welsh dances, sing Welsh folk songs and recite Welsh poems. Some secondary schools in Wales celebrate the Saint’s day with an Eisteddfod, a festival of singing, dancing, and reciting. The climax of the Eisteddfod is often a choir competition. Most information about the Saint comes from a biography written by Rhygyfarch in the eleventh century. But because it was written so long after the Saint’s death, it isn’t likely to be very reliable.Anyway, Rhygyfarch was a bit of a spin-doctor, and slanted his book to make the case for the Welsh church being independent of Canterbury. One writer describes Rhygyfarch’s book as “chiefly a tissue of inventions”. So most of what we know about Saint David is really legend; and none the less inspiring for it. 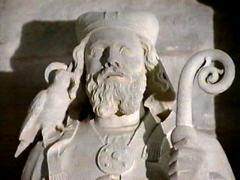 Saint David’s father was a prince called Sant, son of the King of Cardigan. His mother, Non, was the daughter of a local chieftan (and possibly the niece of King Arthur). But David wasn’t the child of a love-filled marriage. He was born after his father either seduced or raped Non, who went on to become a nun. Non left her family and gave birth by the sea. 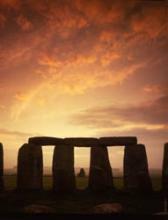 So intense was the birth that her fingers left marks where she grasped the rocks. As David was born a bolt of lightning from heaven struck the rock and split it in two. St David was baptised by Saint Elvis of Munster, and it is said that a blind man was cured by the water used for the baptism. David was schooled at the local monastery, Hen Fynyw, which is south of present day Aberaeron, and was taught by Paulinus, a blind monk. David cured Paulinus of his blindness by making the sign of the cross. Realising that David was a special and holy person, Paulinus sent him off as a missionary to convert the pagan people of Britain. In the course of his travels, David is said to have founded twelve monasteries. At one of his monasteries David became so unpopular with his monks for the life of austerity he made them live, that they tried to poison him. David was warned about this by St Scuthyn, who travelled from Ireland on the back of a sea-monster for the purpose. David blessed the poisoned bread and ate it; and came to no harm. Saint David the preacher ©David was a great church leader, but not in the sense of a present day bishop or archbishop. He was a prophet and a teacher, a man of prayer and a miracle worker. He was the heart of the monastic community he founded in what is now St Davids, and through his direct teaching, and the work of the monks he influenced, he shaped the spirituality of his time and place. David believed that monks should live simply, and he prescribed a harsh life for his followers. As well as praying and celebrating mass, the brothers had to work hard. They rose at dawn for prayer, and then worked in the monastery and the fields around it. David would not allow them to make animals work for them, but made them pull the plough themselves, saying, “every man his own ox.” And while they worked, they continued to pray. They had a spare diet, too, eating only vegetables and bread, and having only milk and water to drink. St David himself drank only water, and is sometimes known in Welsh as ‘Dewi Ddyfrwr’ (David the water drinker). St David’s monks were expected to remain silent, except for prayer or in emergency. But though it was a hard life, David’s holiness and personal charisma were enough to hold the community together in the service of God. The example of his life, and the modernity of his most famous saying – that we should concentrate on “doing the little things in God’s presence with conscientiousness and devotion,” make St David a figure with a contemporary appeal. Saint David is represented with a dove ©St David is often shown with a dove on his shoulder. The bird symbolises the Holy Spirit which gave David the gift of eloquence as he preached the Good News of Christianity. In his last sermon David told his monks to “do the little things, the small things you’ve seen me doing”. …it reminds us that the primary things for us are the relationships around us, the need to work at what’s under our hands, what’s within our reach. We can transform our domestic, our family relationships, our national life to some extent, if we do that with focus and concentration in the presence of God.